This is one of my favourite series and I couldn't get my hands on this fast enough. More than the story, it's the setting, the world and Schwab's beautiful writing style that fascinate me. 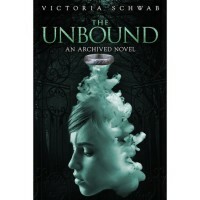 Thankfully Unbound is worthy successor to The Archived. The thing I love about this series is that nothing is black and white for Mac, just like for most people, things lie in a blurry haze of grey AND maybe that's why there's an archive of 'memories' in this world. Things aren't easy or clear for Mac and though she's not a 'prepared' warrior like so many of my other favourite YA protagonists, I love Mac more because I relate to her better. She's got scars, issues with people in her present and past and duties, responsibilities whilst trying not to go insane. I love that she kind of comes round to understanding that in feeling crazy she's not crazy because in actuality what's happening is actually crazy. I'd definitely rank this book higher than the first BUT since I already gave that one five stars... I hadn't completely made my mind up about Wesley in The Archived but I definitely started 'inclining' or liking very much, in this book. His snarky style complements Mackenzie's 'straightman' perfectly. I really like these two together. Again this book sees Mac deal with the mystery at The Archive, which Schwab intricately weaves in between all the other angst, troubles plaguing Mac. The whole insomnia struggle - why it began etc, how Mackenzie deal with it etc - really hit me and touched me. I also loved the other students that Mackenzie meets at Hyde who bring a strange kind of balance to her companions. Schwabs details them wonderfully, so that I feel like we have the beginnings of a new Scooby gang.